Friday, October 12, at The Capitol Hotel Tokyu, Tokyo. For information, contact friends@fwab.jp or Akiko@fwab.org. October 19-21, Lunag Prabang, Lao PDR.Click here for race registration. LFHC has an pressing need for nurses and physicians. LFHC is looking to hire a Director of Nursing and a Nurse Educator to work at the hospital in Luang Prabang. Further information is available on our website or can be obtained by contacting hr@fwablaos.org. Burn victims are unfortunately quite common at LFHC. 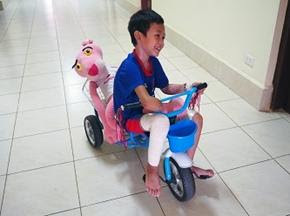 Seven-year-old Liep Thannya was brought to LFHC in March after he grabbed an electrical wire, which resulted in severe burns to his right arm and leg. Doctors performed several surgeries on Liep and had to amputate his right arm below the elbow. He has been recovering in LFHC and receiving physiotherapy. He has learned to become left-handed and has now mastered the use of chopsticks! The staff was happy this month to see Liep riding a little tricycle through the hall of LFHC as part of his occupational therapy while his leg continues to heal. The child life therapy team has been with Liep every step of the way to comfort him during his long stay at the hospital. The nutrition team is working to improve his diet and he will continue physiotherapy to improve his mobility. It’s been a team effort to support Liep and we are so happy to see a smile on his face. Charity Navigator and GuideStar, two organizations that assess the financial performance of nonprofits, have each given their highest rating to Friends Without A Border. Charity Navigator, an independent watchdog of U.S.-based charities, awarded Friends a 4-star rating for “demonstrating strong financial health and commitment to accountability and transparency.” Four stars is the highest rating a nonprofit can achieve. Guidestar, the world’s largest source of information about nonprofits, awarded its 2018 Platinum Seal of Transparency on April 20 to Friends Without A Border. Read more here. 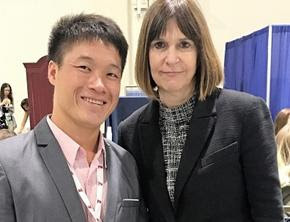 In early May, Kongmeng Sialee, the first and only Child Life Therapist at LFHC, was awarded one of five international scholarships by the Association of Child Life Professionals. 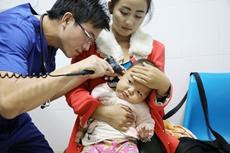 In granting the award, the ACLP noted that Kongmeng has successfully integrated psychosocial care into the care of practices at LFHC. He helps children cope during their hospital stay and prepares children for medical procedures by using therapeutic and medical play. The award ceremony took place at the organization’s annual conference in Washington D.C. Kongmeng was joined by Friends Without A Border Executive Director Nicole Pagourgis at the conference. Read more here. More than 140 supporters of Friends Without A Border turned out on May 23 for our Los Angeles Event. The event raised nearly $100,000. Proceeds help finance operations of LFHC. Dr. Greg Thompson, former LFHC medical director, told the audience the touching story about the treatment of Baby Manner, the hospital’s first successful treament of an infant born with gastroschisis. 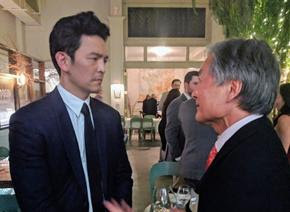 And the event included a special appearance by Kazumi Akao, director of the Outreach Program at LFHC, who is featured in the video “Story of Thongsy,” which was produced by Friends Without A Border.